Create a Bucket List of travel destinations and check them off one at a time with this colorful large 3-panel travel pin map. Use push pins to track your adventures around the globe and create an unforgettable keepsake of your travel memories. This map of the world doubles as a work of interactive art that is sure to become the focal point of your décor thanks to its extra-large size and its bright and lively color palette. Printed on canvas to give it a rich textured look and feel, this world pin map has a modern frameless 3-panel gallery wrap map design. The unique charcoal chalkboard effect for the oceans makes the bright colors of the continents really pop right off the canvas. The extra-large size gives you bigger font sizes and more pinnable space. Swap travel stories with visiting friends and family as you show off your next planned trip and reminisce about your last vacation. You will love how your 3-panel world map becomes your favorite conversation piece in no time at all. Personalize your pin map with your name, favorite quote and a pin legend to truly make the map your own. 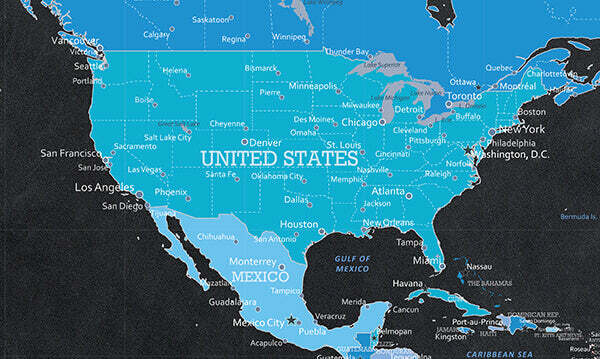 This map makes a great gift for anyone in your life who spends their days dreaming of that next big getaway!